MANILA, Philippines – The 'September 2017 Respiratory Therapist board exam results' together with the list of passers, top 10 examinees, top performing schools and related announcements are available at this website soon as PRC officially released the results online one (1) working day after the last day of board examination. As announced, 597 out of 974 passed the exams. The licensure examinations are administered by PRC Board of Respiratory Therapy headed by its Chairman, Julita V. Toledo and its members, Senen O. Teope and Jesus M. Espinas on September 6-7, 2017 at PRC testing centers in Manila, Baguio, Cebu, Davao and Zamboanga. The schedule of online appointment for issuance of Professional ID and Certificate of Registration will be from September 14-15, 2017. According to the Commission’s Resolution No. 2016-1019 series of 2016 entitled “Schedule of Licensure Examination for Year 2017”, the target release date of September 2017 Respiratory Therapy result will be in two (2) working days after the last day of board examinations or by September 11, 2017 (Monday). However, results may also be released earlier or later without prior notice. On the same exam conducted by PRC on September 2016, results were released after one (1) working day while during September 2015, results were out after three (3) working days. The September 2017 Respiratory Therapist Licensure exams covered topics from Diagnostics (25%), Pathophysiology (25%), Respiratory Care (25%) and Neonatal and Pediatric Care (25%). Respiratory Therapist is one of the programs with less number of examinees being administered by PRC. On the same exams conducted September 2016, 582 out of 818 examinees passed. Cebu Doctors' University ranked first in the top performing schools' list having all 51 examinees passed or an overall passing rate of 100.00%. Ruth Cuyam-An Sacla from Pines City College got the top spot having 89.00% rating followed by John Marlou Lumapas Medado from Cebu Doctors' University garnering 88.75%. During September 2015 Respiratory Therapist board exam, 407 out of 600 examinees successfully passed. San Pedro College - Davao City was the top performing school having 46 out of 47 examinees passed or an overall passing rate of 97.87% followed by Cebu Doctor's University having 30 out of 31 examinees passed or overall passing rate of 96.77%. Crystal Jay Balabis Seran from San Pedro College-Davao City topped the board exam having 88.25% rating followed by Vince Fernando Badon Punzal from Mary Chiles College garnering 87.75% rating. 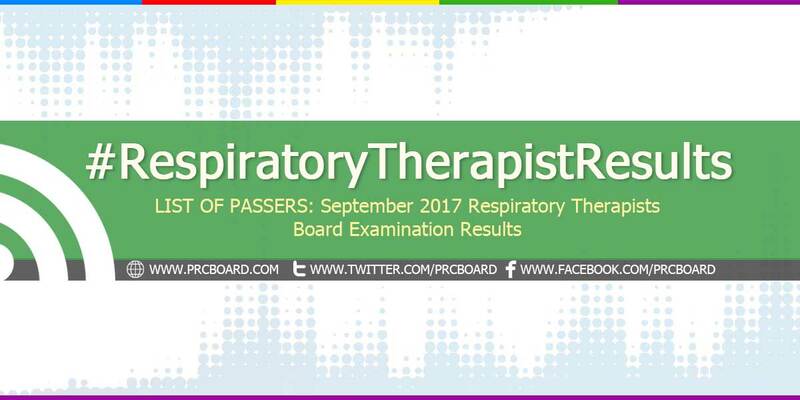 To receive up-to-date news about Respiratory Therapist results for September 2017, we advise our visitors to bookmark this page, visit PRC official website or follow us at our social media pages via Facebook and Twitter.